As a 70 year old Swarovski crystal distributor, we have gathered a lot of knowledge on Swarovski crystals and of course a LOT OF INVENTORY! The one thing we have noticed over the years is how the packaging of the Swarovski rhinestones has evolved. The products inside have changed as well. 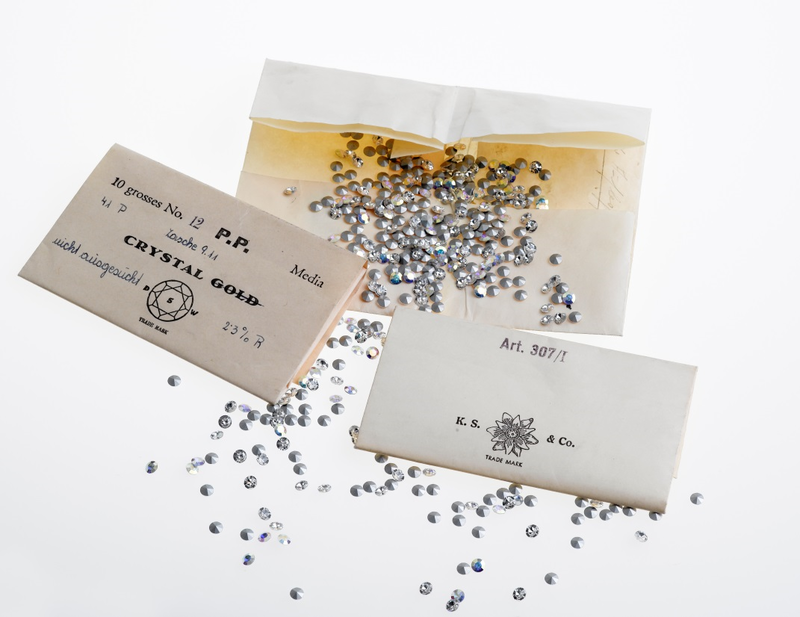 Read more about the evolution of Swarovski Rhinestones themselves here. Here we are going to focus on the packaging of the Swarovski rhinestone, more specifically, the current styles 2058 and 2088 for No Hot Fix and the 2038 and 2078 for Hot Fix. This image below shows two of the oldest Swarovski wrappers. The wrapper with the K.S. & Co. with the Edelweiss logo was the first type of package produced to hold Swarovski crystals. 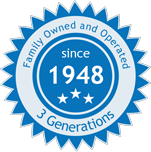 The other wrapper with the DSW and stone image was produced in the 1950s and this logo was used as a distributor/retailer logo. (It is extremely hard to find either one of these packages today.) Of course, there may also be other packages like these that were used for a very short period of time or for specific distribution. We have developed a general timeline which shows the most used Swarovski packages throughout history. Some may still be in circulation today! Please note that all dates are approximate. As you can see from the images above, since 1998, the packages have changed 5 times! You are probably wondering why?! The answer is pretty simple – it comes down to "Constantly improving upon what is good" (as stated by Daniel Swarovski), as well as branding and protecting from counterfeits. Swarovski has changed their "Loose Crystal Components" brand name a number of times. It went from "SWAROVSKI" to "SWAROVSKI COMPONENTS" to "CRYSTALLIZED – With Swarovski Elements" to "SWAROVSKI ELEMENTS" to "Swarovski Crystals". Each time they change their brand name, they change their packaging to correspond with the name change. As you can see, their most current package, released in 2014 has the same, simple brand name they had long ago. Simply, SWAROVSKI. There are a lot of Swarovski counterfeit products on in the market that primarily emanates from Asia. Prior to the release of the silver packages in 2004, Swarovski packages were not sealed and the problem in the marketplace was that unethical businesses were replacing authentic Swarovski rhinestones (beads, etc) with cheap imitations within the original Swarovski packaging. So, while the package was Swarovski, the products inside were not. Another problem with counterfeiting was that similar packages were being printed to look just like Swarovski packages, but the products inside were not Swarovski. We have personally seen these and they look just like Swarovski made packages. Some however, are better than others. For example, we once saw a package for bicone beads that said "5301 8mm", but had the schematic drawing of a 5000 round bead! The only way to be 100% sure that the product you are receiving is actually Swarovski merchandise is to make sure you purchase your beads from an Authorized Distributor of Swarovski products. Be very wary of Swarovski components sold on Ebay and other re-sale websites. If the prices seems too good to be true, it probably is! As a trusted Swarovski Authorized Reseller, you can be sure that when you order Swarovski products from HarMan, you are actually getting Swarovski!